The Villa Schwaiger is a beautiful hotel in a 120 year old building full of history since it was the house of a famous Czech artist, Mr Hanus Schwaiger. This beautiful and charming hotel is conveniently located in the exclusive Embassy District, which gives guests the privilege of enjoying a quiet atmosphere with the city center at hand. 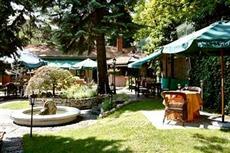 The Villa Schwaiger is the perfect place for a leisure break as a base from which to explore Prague. Guests can relax at the Mini Spa and enjoy gorgeous food at the Villa Schwaiger Restaurant, which offers international cuisine. Guests can also stroll through the gardens where, in the summer months, they can enjoy drinks and meals.